Image of the year, at Bristol Underwater Photography Group (BUPG). Norway lobsters (Nephrops norvegicus), from Gullmarn Fjord near Lysekil on Sewden's west coast. The scene shows one lobster emerging from its hole in the mud to be met by another one... a nice example of fighting behaviour. This shot was taken on a very dark dive to 30 metres on the fine mud of the fjord slope. 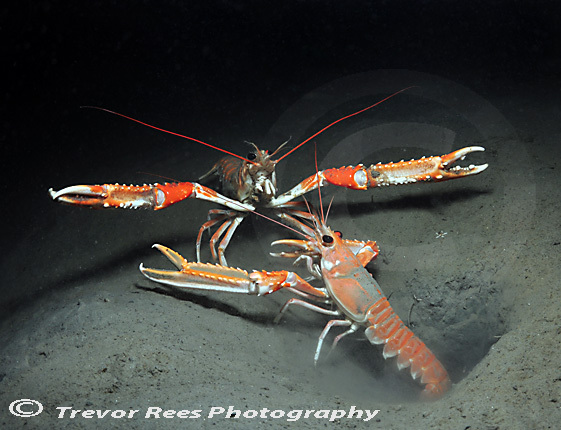 - judged to be the '2012 Image of the year' at Bristol Underwater Photography Group (BUPG) by Alex Mustard.